Roboy is a startling reflection of human motion. Unlike mechanized robots of the past, Roboy mimics human interaction, motion and instinctual structural movements. A design that closely mimics the human anatomy, the mechanics represent human muscles while incorporating the flowing nature of human movement through cords that function as tendons. Dr. Rolf Pfeifer, Director of the Artificial Intelligence Lab of the University of Zurich exudes genius as he introduces Roboy with a sparkle in his own eye that matches the reflection in the eyes of Roboy. In a matter of nine months, a team of forty robotic experts within fifteen institutes, all privately funded and some through crowdsource funding, created a remarkable robot with human motion by the name of Roboy. Led by Rafael Hostettler from the Technical University in Munich, who shared answers to a few questions. Q: How did you leap from mechanical joints to tendon joints? A: Roboy has its roots in the Cronos project (www.cronosproject.net) which preceded the eccerobot (www.eccerobot.org) project. The basic idea in all these projets was to create a system that mimics the muscoloskeletal system of the (in this case) human body. The rationale is that in order to understand how a system really works, you need to be able to build it. Only then you’ll know for sure that you understood all the relevant parts. Q: What scientific and human applications to do you see for Roboy? A: Right now, roboy is a messenger for a technology and field of research. Roboy advertises the idea that to study the dynamics of a human body it makes sense to try to build one. In the near future, we will further develop roboy into a more modular system, where interested research laboratories can buy the parts of roboy that they require for their studies. (Say the legs for walking, an arm for manipulation or to study the complex dynamics of the shoulder) This will make him interesting for fields like bio mechanics, motor learning, physiology and control. Furthermore, the fact that roboy is a full humanoid – as opposed to say just an arm – allows for even more applications, be it in research fields such as human-robotics-interaction and psychology or even outside research. 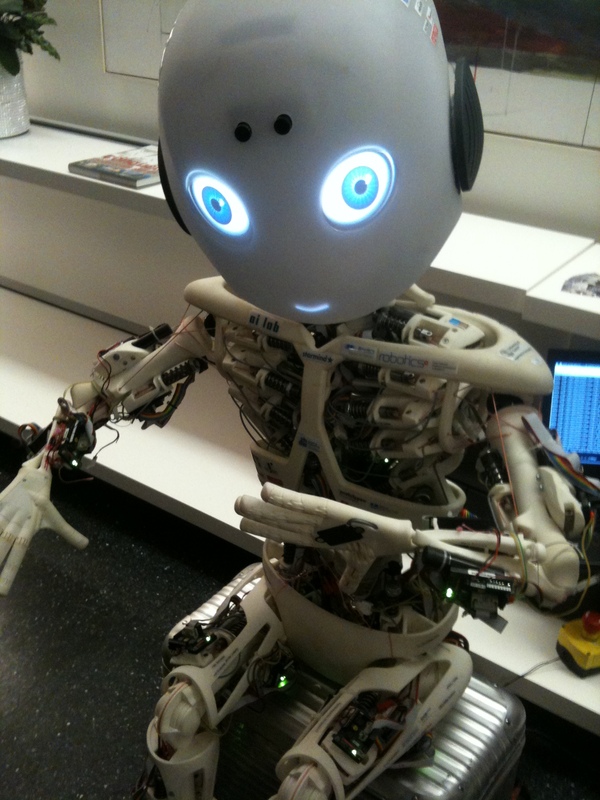 We see roboy as a platform for culture and education as well. E.g. when roboy was developed a theater play introducing him to the world was developed as well and there was also an improvised theatre and dance session in Beijing – both with great success. We’re currently also working with teachers to create a “Roboy at school” day, where roboy visits a school and teaches the children about robotics and their anatomy – with a hands on build-your-own-robot competition as well. Q: In the process of creating Roboy, what unexpected revelations occurred, challenges? How did you overcome the challenges? A: Building a system as complex as roboy in only 9 months is a huge challenge. Even more so, as financing had to be done along the way. Also, with such a small amount of time, you will need to stick to the solution that you expect to work and there’s not much space for experiments. Luckily we had very professional partners with a lot of experience. We tried to use crowd funding to get the money for roboy but it turned out difficult despite the huge media attention we had. So in the end, while crowd funding contributed its part the large part of the money and work came through the industrial partners. Q: At the end of the day, what has surprised you and/or the design team the most? A: Definitely the positive reactions. Roboy is a research project and as such interaction with the public is often difficult, because one has to break down complex topics into bits people can understand. Genius in design, team work, collaboration across borders and institutes, Roboy reveals what is possible to invent for the future. Tags: Artificial Intelligence Lab, Beijing, bio mechanics, classroom, control, Cronos project, crowd funding, culture, Director of the Artificial Intelligence Lab of the University of Zurich, Dr. Rolf Pfeifer, eccerobot project, education, Germany, human anatomy, human body, human motion, motor learning, physiology, Rafael Hostettler, robot, robotic, Roboy, Rolf Pfeifer, Switzerland, teaching, Technical University in Munich. Bookmark the permalink. Things like this scare me so much! Robots will take over the world! Still an absolute triumph for technology though! I agree on both of your points! Look at the video and the expression of Dr. Rolf Pfeifer – his eyes sparkle, everything shifts when he imagines the potential. When I met him … it was his expression that drew me in to learn more and understand why, in so many ways, this robot is different. Always love to hear from readers.